By registering on or placing an order through our web shop you warrant that you’ve read and agree to be legally bound by these Terms and Conditions. Of course we have a registered corporate tax card. To be elligable to place an order with DBOS Clothing AB (Douchebag of Sweden) you must be over 18 years of age. Orders can be made by individuals under the age of 18 with the consent of a person or persons with parental responsibility. DBOS Clothing AB cannot be made responsible of orders made by a minor withouth the consent of a person or persons with parental responsibility. Where applicable, prices are inclusive of VAT at the rate appropriate to the country of receipt within the EU. VAT is not included in our prices for customers outside of the EU, though all prices in the web shop show prices including VAT. In checkout you will see the right price. If you order from outside the EU, just cut off 20% of the price and there you have it! Orders to countries outside of EU may be subject to local VAT, import duties and/or taxes, which are levied once your package reaches your country. DBOS Clothing AB ships your package according to Incoterm Delivered Duty Unpaid (DDU), which means we do not collect VAT, duties and/or taxes on orders to countries outside the EU and we cannot predict what your particular charges may be. If you do incur any such additional charges they must be rendered in order for your package to clear customs. Please contact your local customs office for more information. If your country is part of the European Union (EU), prices include VAT. Delivery costs will be charged in addition; such additional charges are clearly displayed where applicable and included in the ‘Total Cost’. All prices on this online shop includes sales tax (25%). If the sales tax changes we reserve the right to change the price to the corresponding amount. All products remain the property of DBOS Clothing AB until complete payment has arrived. Cost of shipping is included in our prices (within Sweden). Outside of Sweden there will be an additional cost of 100 SEK, about 10 € (VAT included). All our packages are sent using PostNord. We ship your orderd merchendise within 2-4 workingdays. During times of great demand on our products you may need to add another day. We offer secure payments directly through the webshop. Your purchase is managed by our payment partners Paypal and/or Payson, leading companies when it comes to internet shoping. Payson (within Europe, cards with “3d secure” required) collaborates with Visa/MasterCard and the banks Swedbank, Handelsbanken, SEB, Nordea and Danske Bank. We also offer the possiblitity to pay using WyWallet and invoice (29SEK invoce fee applies). DBOS Clothing AB abides by Swedish “Konsumentverkets lag om distansavtal och avtal utanför affärslokaler” which gives you the right to withdraw your purchase within 14 days. If you wish to return a product you have to pay for the return yourself. 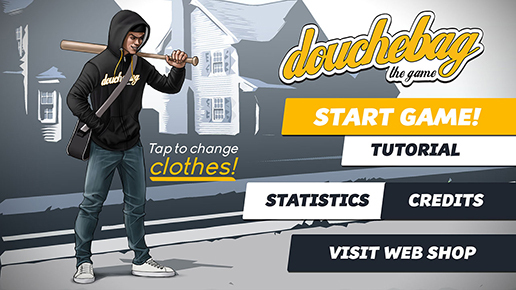 If you purchased a product and for some reason wish to return it, begin by sending an email to retur@douchbagofsweden.com and we’ll try to sort it out as smoothly as possible. DBOS Clothing AB operates a 14 day returns policy starting from the date when your items are picked up at the delivery point. If you wish to return your items, send an email to retur@douchebagofsweden.com for further instructions. Specify your order id and which items you wish to return or exchange. If you want to return items, please specify why. Once we recieve your returned items, we will examine the producs and pay the refund. Once this is done, we will send you a notifiaction of this transaction. If you cancel a purchase and request a refund we, according to The Swedish “Distance and Doorstep Sales Act”, are responsible to fullfil this refund within 30 days, but we will of course try to handle it as swiftly as we can. Complaints: If you wish to file a complaint regarding a faulty item, send an email to retur@douchebagofsweden.com before you file the complaint. Please attach an image of what you feel is wrong with the item. Note the name of the product together with your order id. We will supply a prepaid return bag. If we have the item in stock we will send a new itiem. otherwise we will refund the corresponding amount. The Swedish “Distance and Doorstep Sales Act”, are responsible to fullfil this refund within 30 days, but we will of course try to handle it as swiftly as we can. Damaged goods: It is vital that you examine your goods when you receive them. If the packaging and/or the item is damaged, please inform your delivery point. Save the confirmation you receive that the goods is damaged. We want you to notify us as soon as this occurs, within a week at the latest. Email us at retur@douchebagofsweden.com and we will sort it out as smoothly as possible. DBOS Clothing AB will charge 200SEK for any goods that is not picked up at the delivery point, according to “Swedish Konsumentköplagen”. This is to cover our delivery expenses. If you’ve ordered items and wish to cancel the transaction, you have to pick up the package and return it. Read the whole “Konsumentköplagen” in Swedish here. All attempts at fraud or theft will become a police matter and DBOS Clothing AB reserve the rights to cancel the order if this feared. We reserve the rights of any color deviations to the items presented on the websites. Our ambition is that all images are representative and corresponds to reality. However, different computers/screens may recreate the image differently and therefore we are unable to assure a 100% accordance with reality. We reserve the rights for typos, misprints or errors beyond our control. Force Majeure: DBOS Clothing AB is not liable for failure to perform the party’s obligations if such failure is as a result of Acts of God (including fire, flood, earthquake, storm, hurricane or other natural disaster), war, invasion, act of foreign enemies, hostilities (regardless of whether war is declared), civil war, rebellion, revolution, insurrection, military or usurped power or confiscation, terrorist activities, nationalization, government sanction, blockage, embargo, labor dispute, strike, lockout or interruption or failure of electricity or telephone service. Disputes In case of a dispute between a customer and DBOS Clothing AB we follow the guidelines given by The National Board for Consumer Disputes (ARN). Read more (in Swedish) here. In order for us to handle your purchase and shipment we will request all necessary information needed to deliver your products. Disclosure to third party: DBOS Clothing AB will never disclose any personal inforamation to a third party. DBOS Clothing AB is responsible of handling the information, you as a customer, give to us. We follow GDPR guidelines. . If you wish an excerpt of your personal information please send a written and signed request to us. If you wish to be omitted from the register, contact our customer service info@douchbagofsweden.com. Personal information may refer to: Customer name, email, address, telephone number, purchased products or services, the web address directing you to our site, date and time etc. SPAM: DBOS Clothing AB is not involved in any spamming activities. As our customer you can receive e-mails regarding your order, information on new merchandise, newsletter or other offers. As a subscriber you can easily unsubscribe via a link available in the email. you can use the settings in your browser to reject cookies or to notify you everytime a request of storing a cookie is made. All in all, we sell items of excellent quality at excellent prices. We work with other great companies, eg. PostNord. Make sure to read all text describing each product, size guides and other details that will help you make the right choices. Happy shopping – go bananas!